Tonight –this very evening–Scott Andrews will be a featured poet for the closing event of Poetry Palooza, hosted by Northridge Creative Writing Circle. He will read, along with Chiwan Choi, at 7:00 p.m. in Jerome Richfield 319. 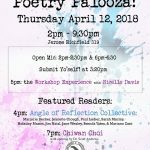 Poetry Palooza begins at 2:00 pm., also in JR 319, and features a full day of poetry–open mic, workshops, award winning poets, members of the Angle of Reflection Collective, free snacks, button making, and more! All are welcome, so please come out and join the poetry fun. Michael Bryson will be the featured scholar in a colloquium hosted by the Department of English and Graduate Studies. Along with co-author Arpi Movsesian, he will present a talk centered on Love and Its Critics: from the Song of Songs to Shakespeare and Milton’s Eden. Their newly released book is available in hardcover and paperback on Amazon and elsewhere. The discussion of their book and its subject of love, its laws, customs, critics–and, especially, poetry–will be moderated by English Department graduate students, Cesar Osuna and Modje Taavon. The colloquium will take place on Monday, April 23, 4:00 p.m. to 6:00 p.m., in the Whitsett Room (SH 451). Food & drink will be available, the event is free, and all are welcome to attend, faculty, staff, guests, and students. California State University Northridge Distinguished Visiting Speakers Series is pleased to welcome Qui Nguyen (Marvel studios writer and co-founder of Vampire Cowboys) and Abby Marcus (grant writer & producer/manager of Vampire Cowboys) for an evening of innovative craft talks & fun workshops. Vampire Cowboys is an OBIE Award winning “geek theatre” company that creates and produces new works of theatre based in action/adventure and dark comedy with a comic book aesthetic. The company actively pursues the mating of different genres with varied theatrical styles to create an eclectic structure to tell its stories. They aim to bridge the gap between mass media entertainment and the performing arts, exposing the community to challenging, thought-provoking live entertainment rooted in today’s pop-culture vernacular. The event will take place on Wednesday, April 18, at 5:00 p.m. in JR 319. All are welcome. The LRC will be hosting the following series of workshops that promise to be a big boon to students here at the end of the term. All workshops will take place in the LRC on the 3rd floor of Oviatt Library. Please help spread the word. The Academy of American Poets Prize Competition is now accepting submissions for the 2018 award. The winner will receive a cash prize from the Academy of American Poets and publication in the Northridge Review. One Honorable Mention will also be awarded. Additionally, the AAP is pleased to announce the Aliki Perroti and Seth Frank Most Promising Young Poet Award: Students 23 years-old or younger who have won the AAP prize will be considered for an additional $1000 award. Interested students should submit one to three poems to the English Department Office in ST 706. Poems may be any length or style. The student’s name and/or any other identifying information should not appear on the manuscript itself, but the entry should include a cover sheet that lists the following information: name, address, phone number, email address, and the title/s of the poem/s submitted. Submissions are judged anonymously. For more information please contact: Leilani Hall at leilani.hall@csun.edu, or Dorothy Barresi at dorothy.barresi@csun.edu. Following next Tuesday’s launch of The Northridge Review (see Reminders below), the magazine will be re-opening its submission portal for a final week. Please encourage your students to submit! It’s always a thrill to publish the amazing writing going on here at CSUN, and the Review provides an excellent showcase for student writers and their good work. Submissions can be made online at https://thenorthridgereview.submittable.com/submit. On Friday, May 11, the College of Humanities will be sponsoring a One-Day Scholarly Publishing Seminar that with Carole Sargent, Ph.D., English. Sargent will be offering two workshops, one on articles (9:30 a.m. to 12:00 p.m.) and one on books (12:30 p.m. to 3:00 p.m.). All are welcome to attend one or both workshops, but please do register here: https://www.csun.edu/undergraduate-studies/faculty-development/publishing-workshops-carole-sargent. More information about Sargent’s workshops can be found here: https://www.publishingadvising.com/. This is the weekend of Sigma Tau and AGSE’s first ever unconference, “The Politics of Participation in Popular Culture.” The event will take place on Saturday, April 14, from 11:00 a.m. to 3:00 p.m. in the USU and feature a keynote address by Henry Jenkins. Throughout the day, attendees will have the opportunity to enjoy not just paper panels, but also short “soapbox” talks, creative roundtables, project demos such as extemporaneous Twitter fiction, and a curated arts exhibition or creative reading. The staff of The Northridge Review is excited to remind you of the imminent appearance of its Spring 2018 issue, to be celebrated at next week’s launch reaching on Tuesday, April 17, from 6:00 p.m. to 9:00 p.m. in CSUN’s Bianchi Planetarium. The evening will feature an introductory open-mic event, to begin at 6:00 p.m. (sign-up at 5:45), with the formal reading from the magazine to begin at 7:00 p.m. All are welcome to come out and read, so please encourage your students to participate. There will be good writing and fun for all. And there will be food! Don’t forget that spring is award time, with a host of English department awards available to qualified students. Undergraduate awards are The Henry Van Slooten Scholarship in English ($500), The Linda Nichols Joseph English Merit Scholarship ($2000), The Lesley Johnstone Memorial Award $500), The Robert apRoberts English Honors Essay Prize $250), The William L. Wilson Award ($1,600), The Philip E. Love English 205 Scholarship ($500); graduate awards are The Professor Mitchell Marcus Prize in English ($4,000), The Mahlon Gaumer Award ($500), The Harry Finestone Award in English ($750)m The Irene Clark Scholarship for Rhetoric and Composition ($500), and The Angeline Olliff Memorial Scholarship. These awards recognize different achievements and honor different people of note in the history and tradition of our department, but all are very meaningful to students, so please consider nominating your best and brightest, and encourage such students to apply. For more information, see https://www.csun.edu/humanities/english/english-department-awards—spring-2018, or contact Leilani Hall, Chair, Amenities and Awards Committee, at leilani.hall@csun.edu.